doi:10.4136/jbise.2011.49078 Published Online September 2011 (http://www.SciRP.org/journal/jbise/). Morristown-Hamblen Healthcare System, Morristown, USA. Received 5 July 2011; revised 26 July 2011; accepted 3 August 2011.
duration of exposure and biological response in animals. expectancy in US adults, men and women [3,28-31]. 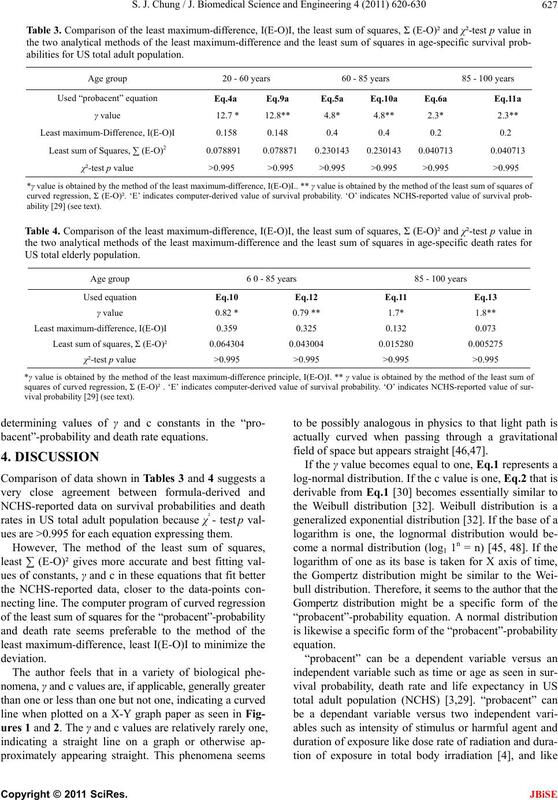 dict probabilities in general biomedical phenomena. a is an intercept and b a slope. essentially similar to the Weibull distribution . 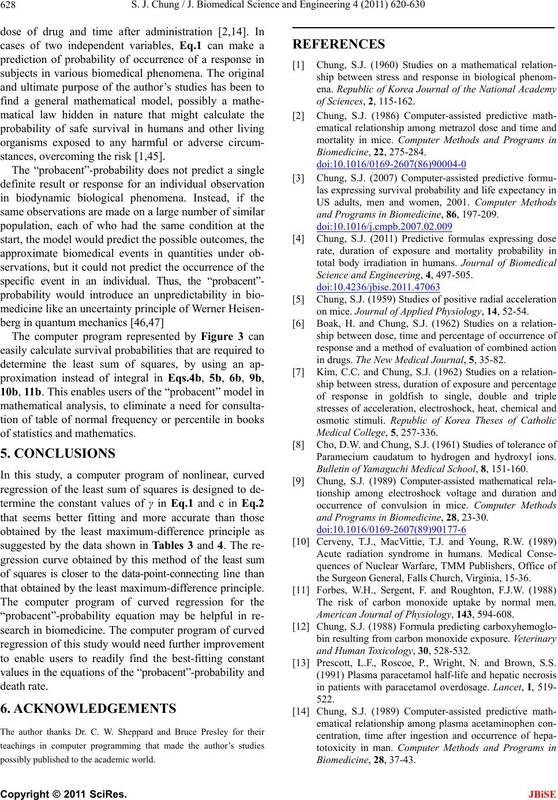 ponential and the Weibull distributions . veal a downward convexity on the graph. scale) on the right scale and “probacent” (P) on the left scale. solid line can be expressed by Eqs.4-6. 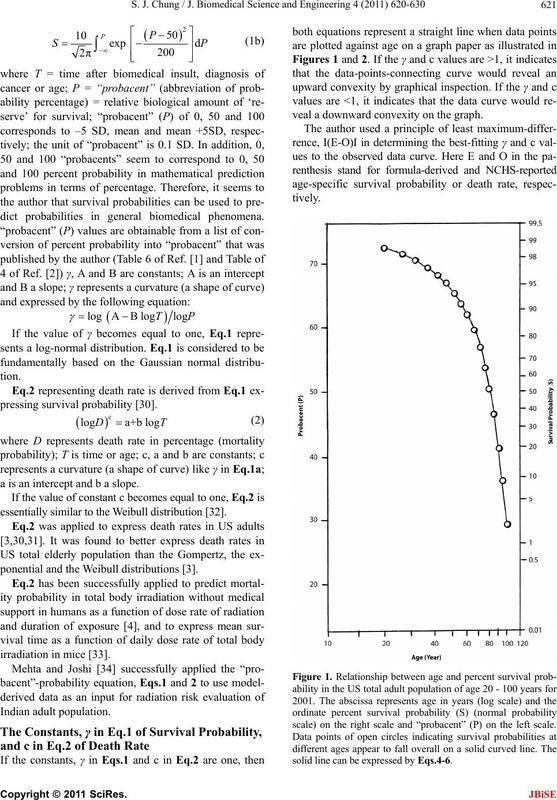 mortality model expressed by equation, D = 10 (-2.2674 + 0.03779T). the Gompertz model ±3.2%. Source: reference . the sum of deviation [37-42]. author to the NCHS-reported data . 2001, Natl. Vital Stat. Rep. 52 (2004) 1-40 ). trated in Figures 1 and 2.
the best-fitting constant values, γ and c.
the difference) is used to minimize the deviation. 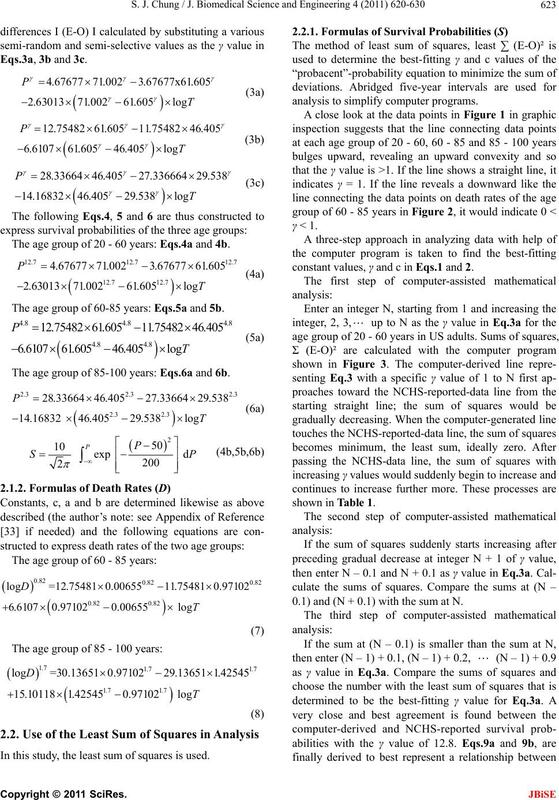 B in Eq.1 is described in Appendix of Ref. . The age group of 20 - 60 years: Eqs.4a and 4b. The age group of 60-85 years: Eqs.5a and 5b. 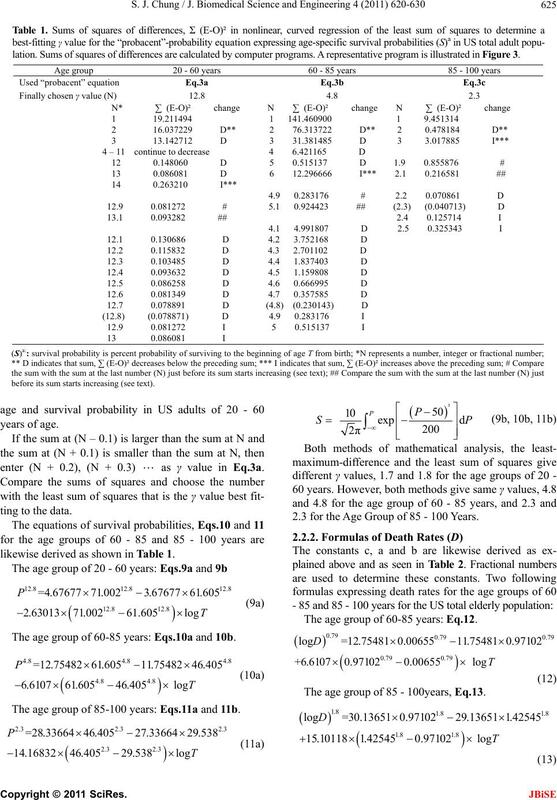 The age group of 85-100 years: Eqs.6a and 6b. In this study, the least sum of squares is used. analysis to simplify computer programs. constant values, γ and c in Eqs.1 and 2. 0.1) and (N + 0.1) with the sum at N.
bles 1 and 3. 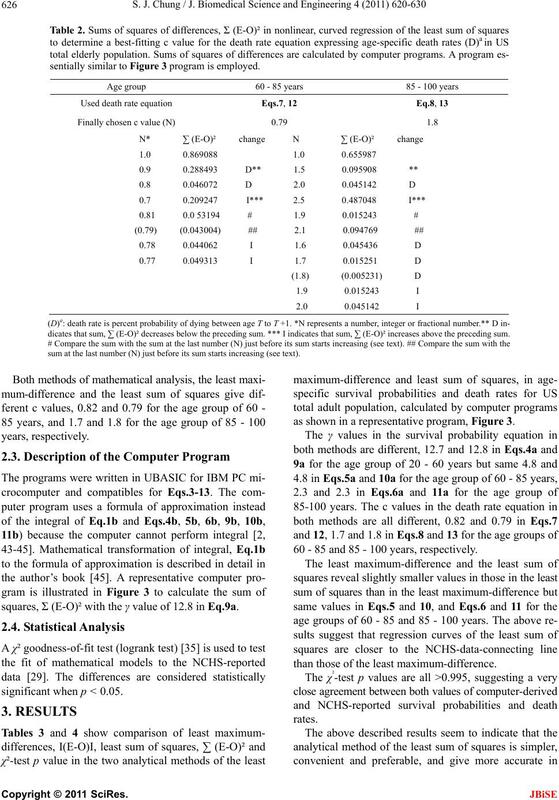 This program is for γ value of 12.8 in Eq.4a for the age group of 20 - 60 years. lation. Sums of squares of differences are calculated by computer programs. A representative program is illustrated in Figur e 3.
before its sum starts increasing (see text). enter (N + 0.2), (N + 0.3)  as γ value in Eq.3a. likewise derived as shown in Table 1. The age group of 60-85 years: Eqs.10a and 10b. 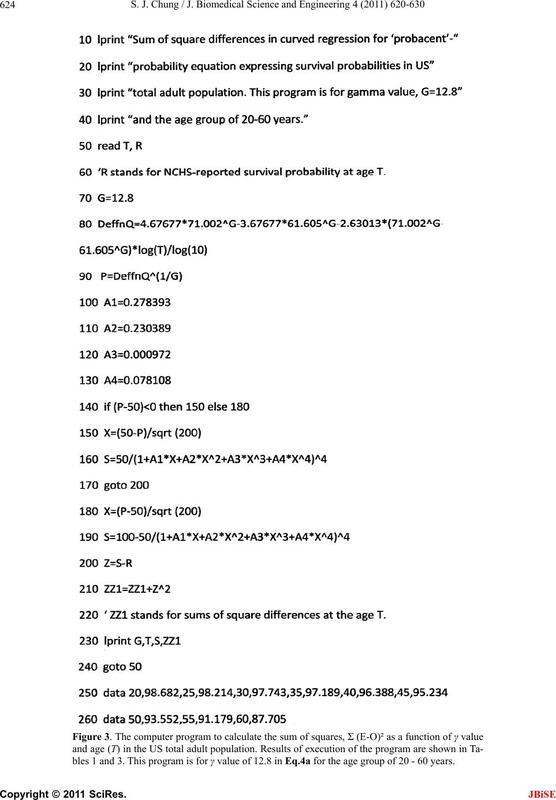 The age group of 85-100 years: Eqs.11a and 11b. 2.3 for the Age Group of 85 - 100 Years. The age group of 60-85 years: Eq.12. The age group of 85 - 100years, Eq.13. sentially similar to Figure 3 program is employed. dicates that sum, ∑ (E-O)² decreases below the preceding sum. *** I indicates that sum, ∑ (E-O)² increases above the preceding sum. sum at the last number (N) just before its sum starts increasing (see text). squares, Σ (E-O)² with the γ value of 12.8 in Eq.9a. significant when p < 0.05.
as shown in a representative program, Figure 3. 60 - 85 and 85 - 100 years, respectively. than those of the least maximum-difference. abilities for US total adult population. 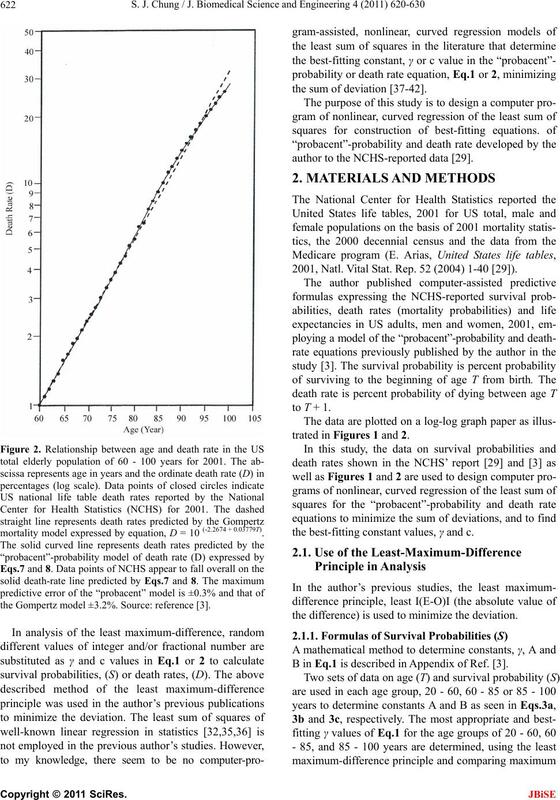 bacent”-probability and death rate equations. 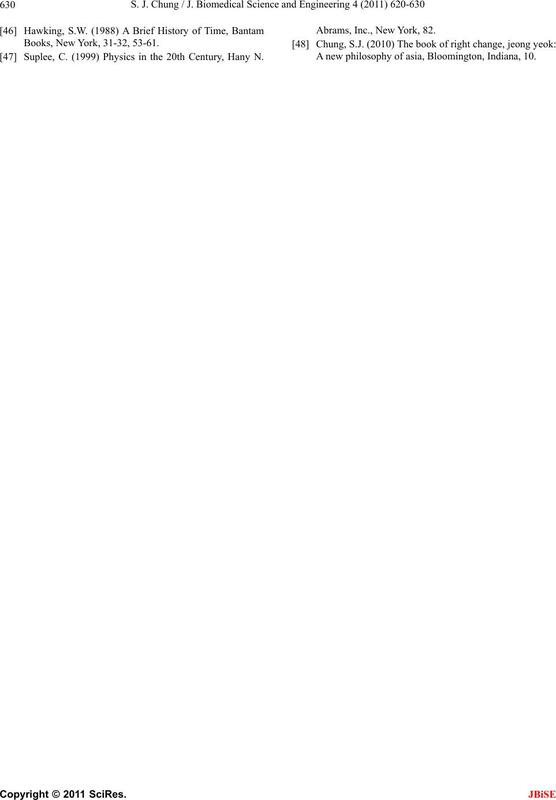 ues are >0.995 for each equation expressing them. field of space but appears straight [46,47]. stances, overcoming the risk [1,45]. that obtained by the least maximum-difference principle. possibly published to the academic world. and Programs in Biomedicine, 86, 197-209. Science and Engineering, 4, 497-505.
on mice. Journal of Applied Physiology, 14, 52-54.
in drugs. The New Medical Journal, 5, 35-82. Paramecium caudatum to hydrogen and hydroxyl ions. Bulletin of Yamaguchi Medical School, 8, 151-160.
and Programs in Biomedicine, 28, 23-30.
the Surgeon General, Falls Church, Virginia, 15-36. The risk of carbon monoxide uptake by normal men. 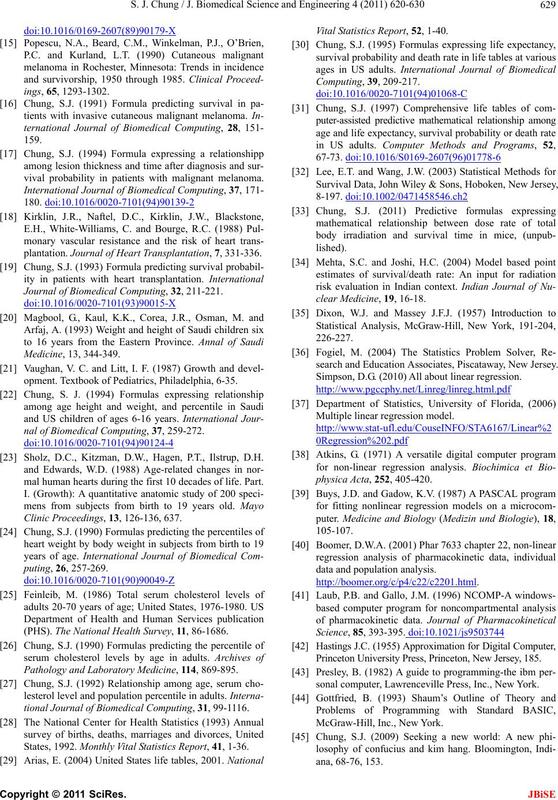 American Journal of Physiology, 143, 594-608.
and Human Toxicology, 30, 528-532. Prescott, L.F., Roscoe, P., Wright, N. and Brown, S.S.
vival probability in patients with malignant melanoma. plantation. Journal of Heart Transplantation, 7, 331-336. 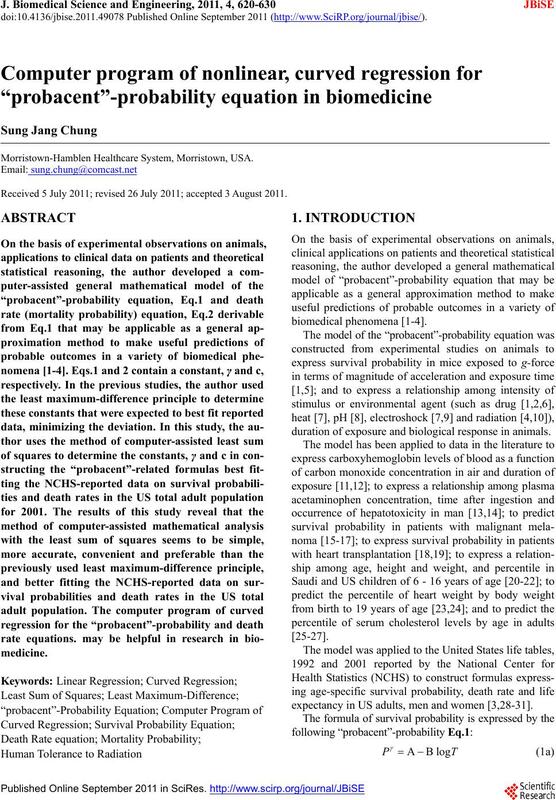 Journal of Biomedical Computing, 32, 211-221.
opment. Textbook of Pediatrics, Philadelphia, 6-35.
nal of Biomedical Computing, 37, 259-272. Sholz, D.C., Kitzman, D.W., Hagen, P.T., Ilstrup, D.H.
mal human hearts during the first 10 decades of life. Part. Clinic Proceedings, 13, 126-136, 637. (PHS). The National Health Survey, 11, 86-1686. Pathology and Laboratory Medicine, 114, 869-895.
tional Journal of Biomedical Computing, 31, 99-1116. States, 1992. Monthly Vital Statistics Report, 41, 1-36. Vital Statistics Report, 52, 1-40.
search and Education Associates, Piscataway, New Jersey. Simpson, D.G. (2010) All about linear regression. Princeton University Press, Princeton, New Jersey, 185.
sonal computer, Lawrenceville Press, Inc., New York. Books, New York, 31-32, 53-61. Suplee, C. (1999) Physics in the 20th Century, Hany N.
Abrams, Inc., New York, 82. A new philosophy of asia, Bloomington, Indiana, 10.